I have two polishes from SinfulColors Sheer Lustre Glitter Topcoats collection to show you, and both are festive choices if you need a last minute holiday nail idea. There are 6 polishes in the Sheer Lustre collection and all are meant to be layered over another polish to "transform your fave shades to instant glitz and glam", according to SinfulColors. 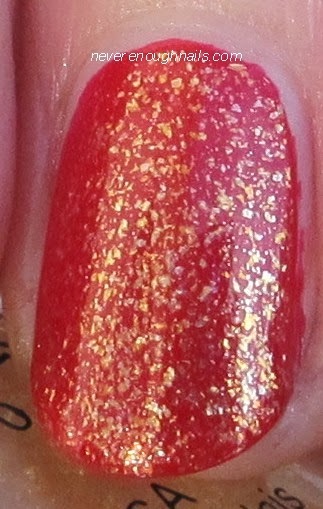 This lovely gold shimmer topper is SinfulColors 24 Karat. 24 Karat could definitely add some gold pizazz to any old creme polish. It's not really glitter, there is no texture to it, but more like soft flecks of gold in a clear base. This is one easy coat of 24 Karat over SinfulColors SinfulShine Devious. 24 Karat is packed with gold flecks, so one coat is perfect. I found this to be extremely easy to apply. 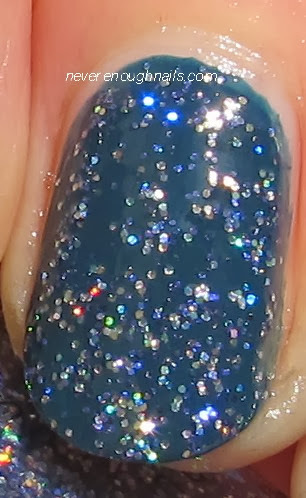 This holographic glitter treat is SinfulColors Top Me Off, a mix of blue and silver holo glitter in a clear base. This was way more holo in person- it looked more like it does in the bottle, with rainbows flashing all over the place. This is one coat of Top Me Off over SinfulColors SinfulShine Set the Mood. I think Top Me Off could be worn on it's own in three coats or so, it was pretty dense. It applied really well, no problems at all. I love both of these toppers, especially Top Me Off. There is also a gorgeous turquoise topper in this collection that I think I need to go hunt down. At the excellent price of $1.99, it's fun to mix and match these with other SinfulColors polishes to make new looks. These are available exclusively at Walgreens.